The regular sale of tickets started on FRIDAY, MAY 25th at 9am (UK time), via Seetickets.com and also Ticketmaster.co.uk. Our thanks to Paul Gribble for sending over the picture of the ticket, to the right. The third UK show in a row, which found the band having travelled up the motorway to the West Midlands city of Birmingham, and the rather lovely and plush setting of the Symphony Hall. Opening in 1991, it seemed a much more modern building than that - perhaps it has been refurbished recently? In any case, it proved to be a wonderful place to see the band. The sound was exemplary - I found myself looking around for rear speakers, as the acoustics gave an immersive, surround feel to the music. Enveloped in the swirling chords, enchanted by the light show - it really doesn't get much better than this. Added to that, really comfortable seating; a concern that this would lead to a static audience, hard to rouse onto their feet, were unfounded. Of course, last night was on the whole, standing, with the expected dynamic that offers, but fears that the audience wouldn't react as well were dashed - the conclusion of pretty much every song was met with healthy numbers of the audience on their feet clapping and cheering. For this latest show on the tour, during his customary initial thanks and welcome to the audience, Nick said: "Well, as I hope people now know, we are not the Australian Roger Waters, we are not the Danish David Gilmours. 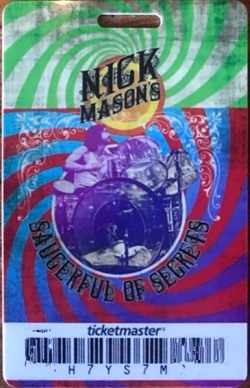 We are Nick Mason's Saucerful Of Secrets. And very happy to be back here in Birmingham; some of you will know I was actually born in Birmingham, [puts on accent] but I lost the accent because people thought I was in The Move. I never wanted to leave Birmingham - I was dragged, kicking and screaming; I did my best, but I was only two years old, sadly. Anyway, on with the show..."
The band now have a deserved day off before they travel a few hours up the motorway to Manchester, for the first of a trio of shows over three days to conclude the 2018 tour. 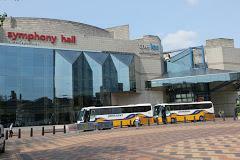 We decided on Birmingham with it being the Symphony Hall so the acoustics would be first class and to make a short break out of it. We were expecting something a bit low key but it was anything but. The performance was stunning. All the tracks covered were outstanding, some even better than the original, and to go from the whimsical vocals of the early Syd Barrett through to the melodic experimentation of space rock then onto all the neglected but wonderful epics like 'Atom Heart Mother' (whoever had the bright idea of bookending it between 'If' deserves a medal) and we got tracks from Meddle as well! The concert covered a period of constant change and progression. Nick Mason as the archivist was the best person to put this show together and his playing was fantastic and it makes you realise just what a huge part he played in the early years as did Richard Wright. The band were all first class going from tracks like Vegetable Man, Interstellar Overdrive and finishing of with the title track 'Saucerful of Secrets' and 'Point me at the Sky'......'all we have to say to you is goodbye' the audience did not want to say goodbye! We could not believe what a brilliant show we were witnessing......this show could run and run year in and year out. It was so different but familiar and the infectious enthusiasm and sheer verve and joy at playing as well as the sheer delight of the audience hearing tracks live that they never expected to hear again added to the excitement of the five star show. Thank you Nick and all the Saucers! We had a fantastic time and hopefully we can follow this up with another one!!! !